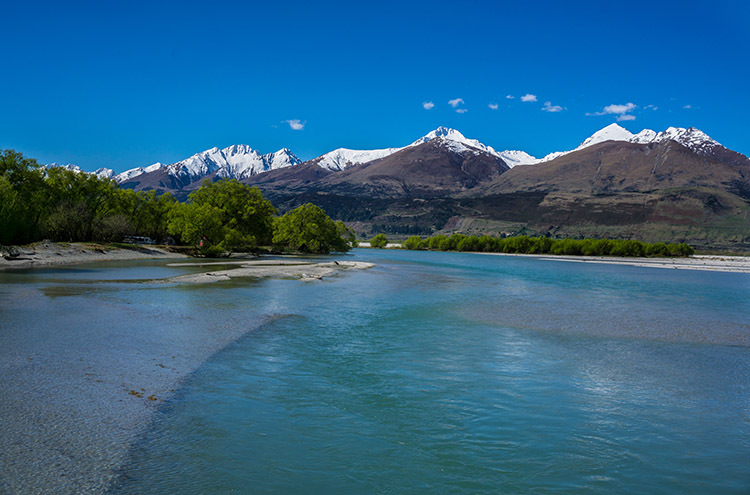 Queenstown is known as one of New Zealand’s most beautiful towns (at least in terms of scenery), but what are things like when you leave the comfort of town for the winding roads to Glenorchy, Paradise and Kinloch? 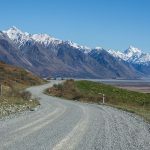 This drive, and the walks you’ll want to do in-between driving, features some classic New Zealand mountain scenery (Lord of the Rings was partly filmed in the area) and is easily one of the highlights of a trip to Queenstown. 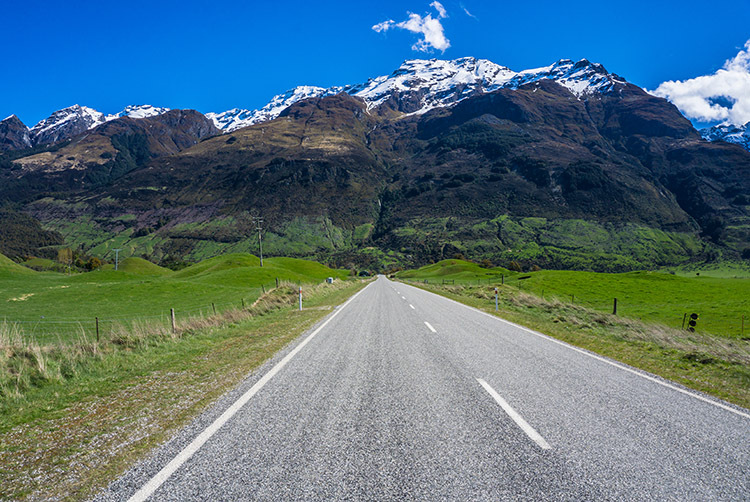 Interested in driving these scenic roads near Queenstown? Keep reading for more information (or, more accurately, heaps of photos!). 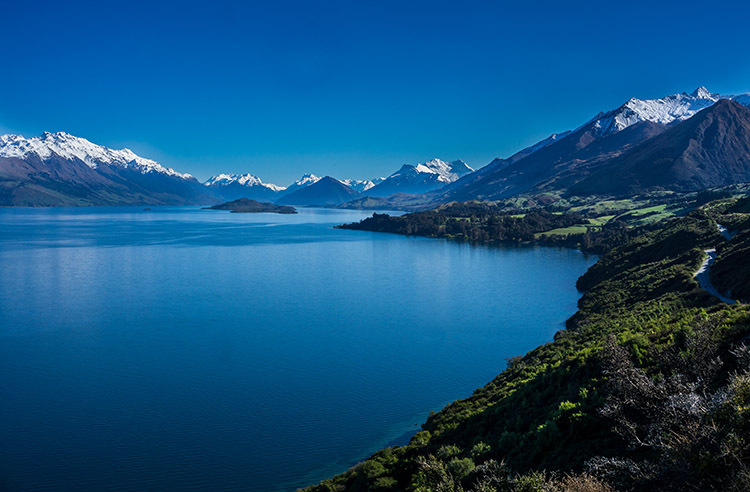 The drive from Queenstown to Glenorchy should take around 45 minutes, but that’s if you don’t make any stops (and you definitely will). Plan on spending at least a couple of hours on this journey and stop off at some of the various bays and beaches along the way. 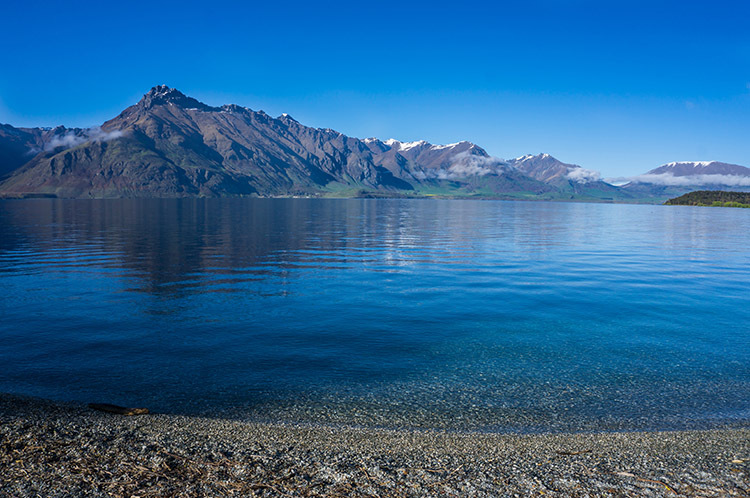 Highlights include Wilson’s Bay and Bobs Cove, two of the best beaches near Queenstown (and some of the best lake beaches in New Zealand). 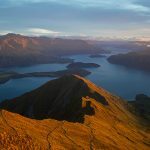 The short hike to the viewpoint above Bobs Cove is a must-do and you can also head up to nearby Moke Lake for another short hike. This road is still spectacular without the hiking stops. 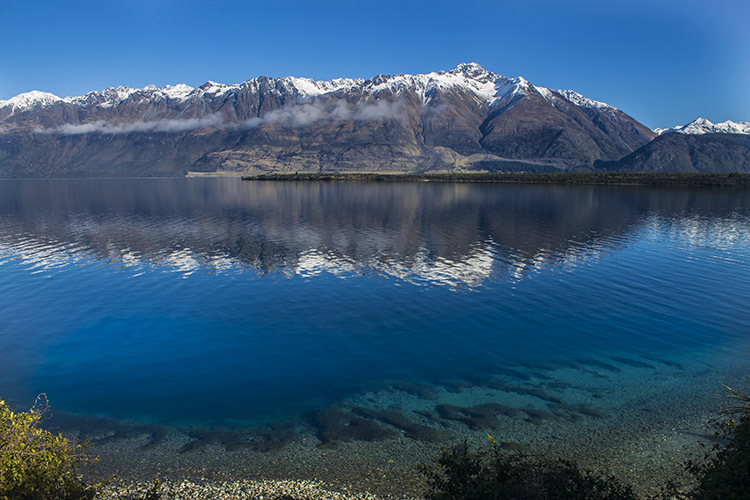 Along the way there are places to pull over by the side of the road and appreciate the views of snow-capped mountains (in winter / spring anyway) lining the crisp blue waters of Lake Wakatipu. I drove this road in winter (and again in spring) and it was icy the first time – make sure you drive to the conditions and keep your eye on the road! 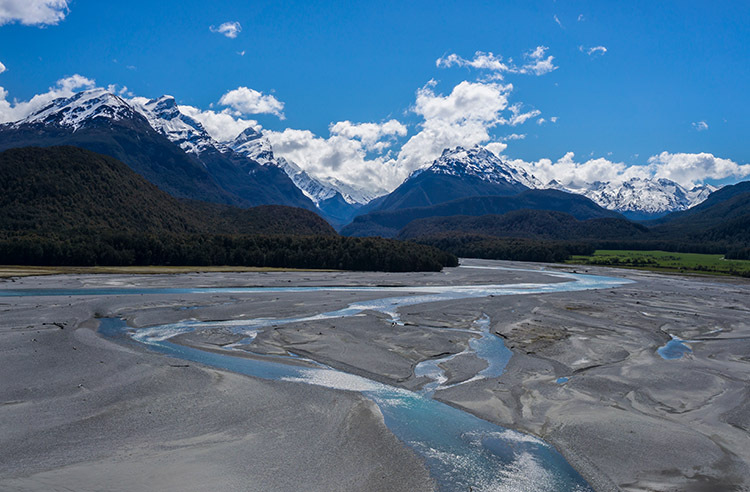 This small town is popular with tourists and boasts adventure activities like jet boating and scenic flights over mountains (and as far away as Milford Sound). 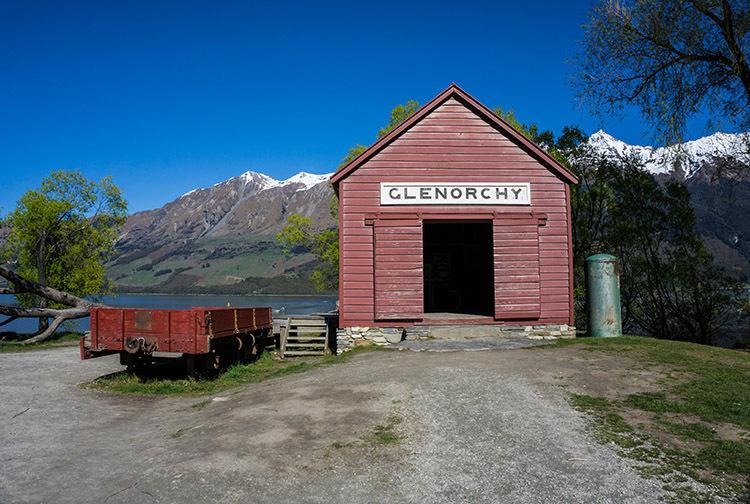 The red “Glenorchy” boat shed by the lake attracts heaps of tourists and there are some nice cafes and shops to explore. 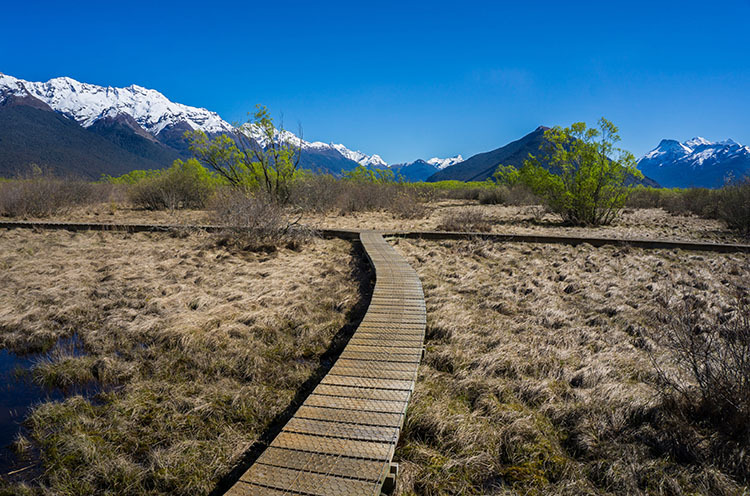 The real highlight is the Glenorchy Walkway, a one – two hour hike which takes you through wetlands to the Glenorchy Lagoon. 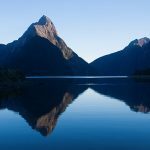 On a still day this lake (or series of lakes) perfectly reflects the surrounding mountains and makes for some great photo opportunities. 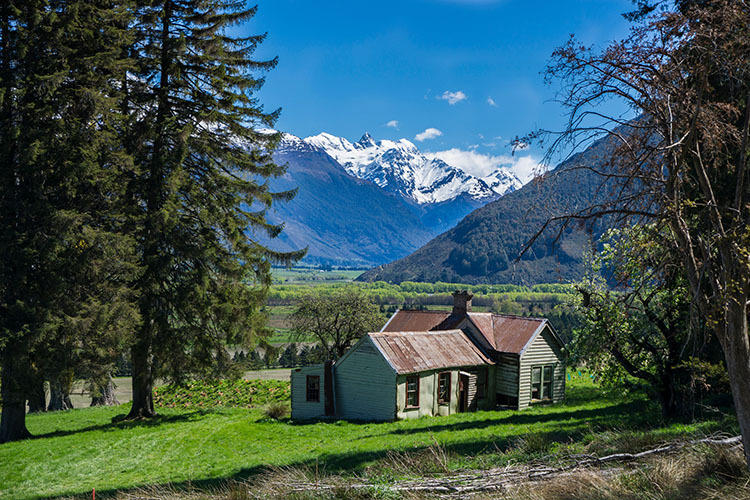 If you’re in a hurry you could head back to Queenstown from Glenorchy, but the road ahead promises more riches. 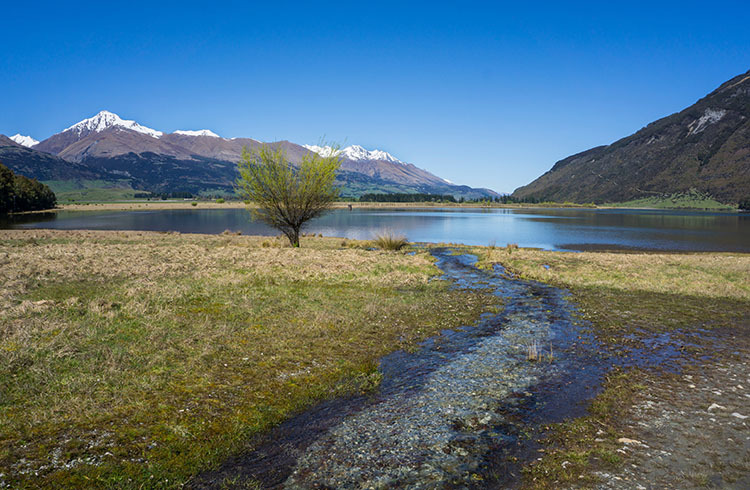 The road from Glenorchy to Paradise first takes you above Glenorchy Lagoon and then on towards a junction – left will take you to Kinloch and continuing straight will take you to Paradise. The road soon becomes gravel, but it shouldn’t be a problem for most vehicles. It takes around 30 minutes to reach Paradise, but make sure to stop off at Diamond Lake on the way. 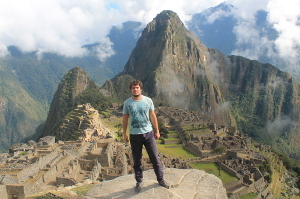 The first time I visited Paradise I was underwhelmed. Like all New Zealand towns, it has a sign (some say one of the most photographed town signs in the country) but that was pretty much it. 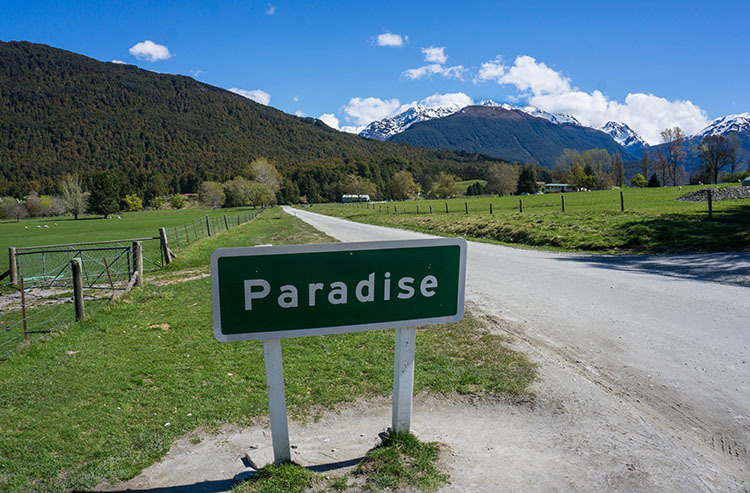 I saw a couple of buildings, but it was basically just farmland with a sign saying Paradise. The next time I discovered the Paradise Trust Homestead, and the walk which starts near it. You can stay in various standards of accommodation, but the collection of old buildings is interesting to see regardless. From there a loop track takes you to some stunning views of the area. We had an old dog join us for the first part of the walk, but he soon gave up. The track gets muddy in parts and seems very hidden from the tourist trail – we didn’t see any other people on the entire track. On the way back, we saw an alter and chairs set up – this would be the perfect place for a small but very scenic wedding. After Paradise we kept driving to see what was at the end of the line, but what eventually thwarted by a rough road. 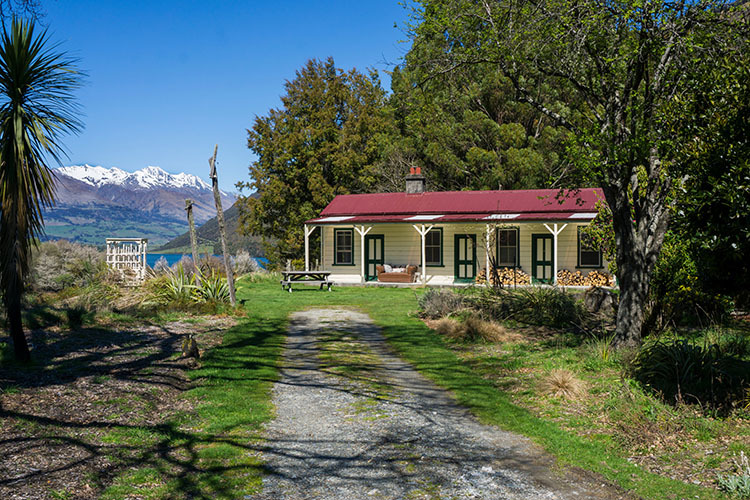 To get to Kinloch you’ll have to drive back towards Glenorchy until you reach the turnoff. 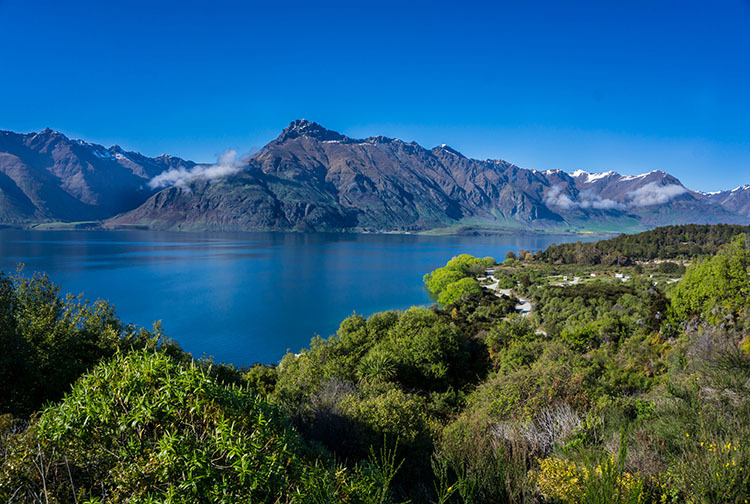 The road to Kinloch is another scenic road near Queenstown – you’ll see heaps of mountains and the bright blue water of the Dart River. 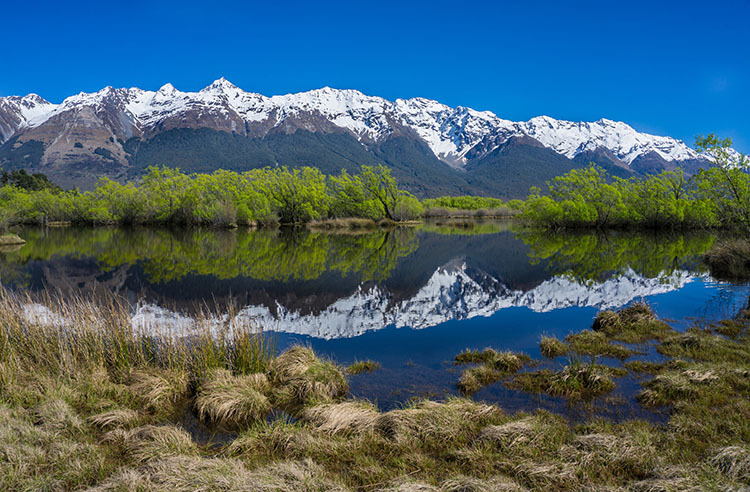 It takes around 30 minutes from the turnoff but again you’ll be stopping heaps for photos if you’re anything like us. There isn’t much to see in Kinloch, but there is a lodge, a café / restaurant and a camping ground. 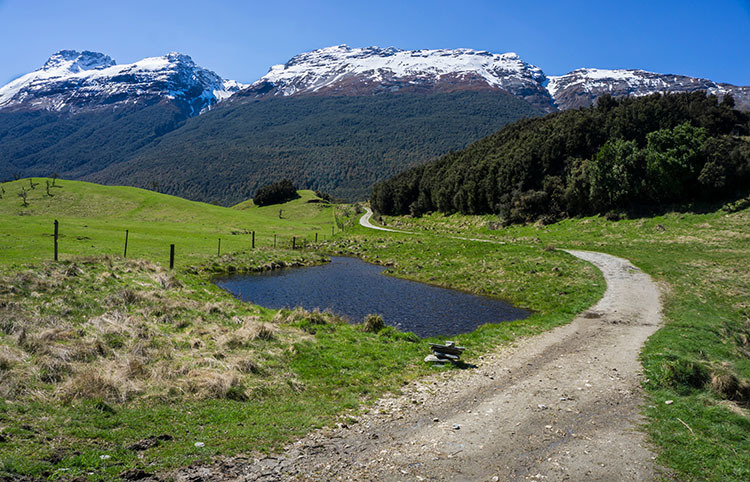 It seems to mainly be a base for doing the walks in the area (Caples / Greenstone tracks and the Routeburn). As countless inspirational travel bloggers will tell you, it’s the journey that’s important, not the destination. I hate to agree with them, but it is kind of true in this case. 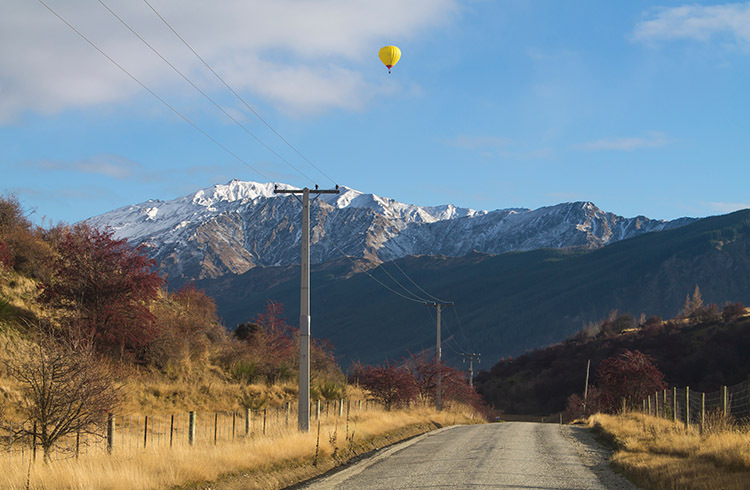 Pretty much anywhere you drive from Queenstown will feature nice scenery. 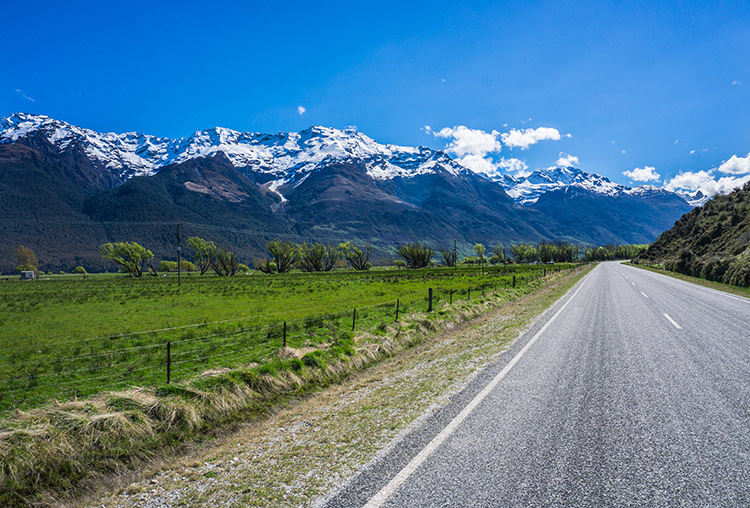 The road to Milford Sound (where many tourists will do a day trip) is spectacular in parts and the quiet roads around Arrowtown are also fun to explore. 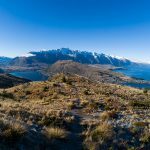 You can also drive up to the Remarkables ski field and the Crown Range, which separates Queenstown and Wanaka. 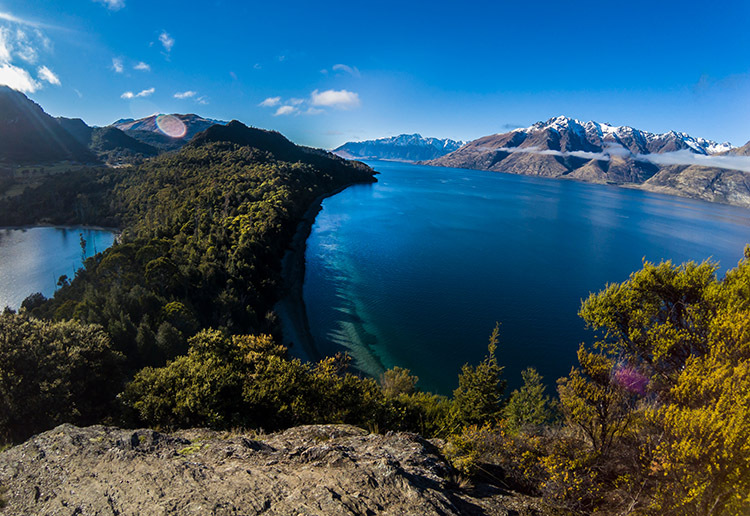 Are you planning on exploring the scenic roads near Queenstown? Let me know in the comments below!